Published in the April 21, 2009 feature section of Canada’s Guelph Tribune, a Metroland Media Group Ltd. publication. Guelph, Ontario — I blame it all on Guelph. Long before I cycled for adventure in Western Canada, the United States, Mexico, Belize, Cuba, Thailand, Laos, New Zealand, England and Goa, India, I cycled in Guelph. My family moved to Guelph in August of 1975 and I quickly discovered that though the high school I attended was less than five kilometres away, it took most of an hour to reach it by public bus. I suffered this for a few years, but one Sunday curiosity and stubbornness led me and my bicycle onto a dirt road, past a quarry, under a highway and behind the football field of Centennial Collegiate. It was fun, easy and took less than 30 minutes. I was hooked. I cycled whenever the weather allowed and the transit system lacked: after a shift at Nancy’s Deli or a few drinks at The Chooch (no buses after 11 p. m.), around the newly flooded Guelph Lake (no buses on Sundays), and whenever I wanted to get somewhere fast. I grudgingly got my driver’s licence at 27, only to survive a series of highway collisions that left my vehicles totalled and my confidence shattered. “I’m not meant to drive,” I told myself, and got back on a bicycle. I continued riding a bicycle to university, to work and for fun. And, when I moved to Vancouver in 1991 and started a car-free life in that burgeoning metropolis, I credited Guelph’s wide roads and sparse traffic for creating the confident cycle-a-holic that I had become. I explored my new city on two wheels, and when I travelled to other cities – Auckland, Bangkok, Havana, London – it made sense to ride a bike. It was familiar, efficient and engaging. I could breeze past tourist traps, then slowly take in ordinary life as a visitor, not a tourist. Naturally, one of the first things I did when I returned to Guelph this month was borrow a bike. I pulled on an orange windbreaker and pedalled this little city’s wide roads and bike trails and marvelled at the ease of it. “How do you find riding in all this traffic?” asked a Guelphite, motioning to Gordon Street. I looked at the sparse stretch of pavement and laughed. I’d been riding alongside honking, left-hand-drive cars, vans and buses in rush-hour London just days before; and busy India before that. I’ll be there to celebrate better cycling in one of southern Ontario’s most beautiful and bike-ready cities, and I hope you are too. It’s not just about riding a bike; it’s about how you see your city and how you see your world: slowly. Get on a bike and if you get hooked, go ahead – blame it on Guelph. 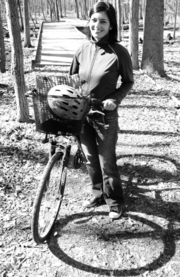 Ulrike Rodrigues writes about alternative culture, independent travel, sustainable living and riding a bicycle ( http://www.ulrike.ca ) and contributes regularly to MOMENTUM, North America’s urban cycling magazine. ← Live and cycle in Goa?